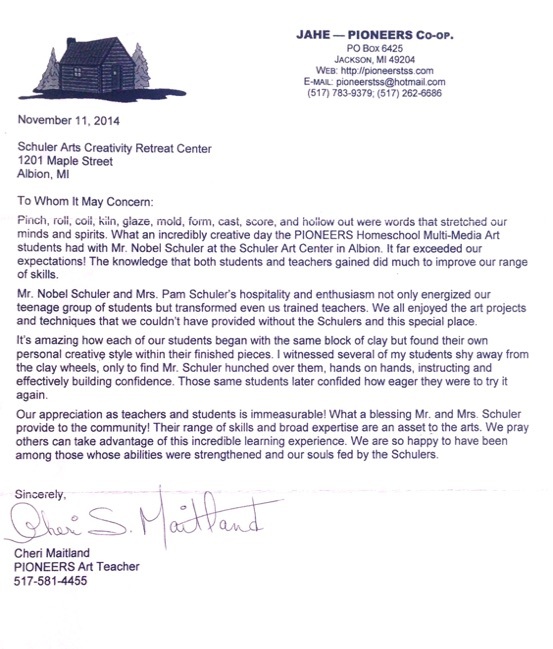 Schuler Arts is an absolute treasure for the Albion Community as well as surrounding areas. The studio is a warm and welcoming environment and the staff members are exceptional teachers and guides. They have incredible patients while working with all different groups with varing skill levels and ages. I have enjoyed the studio with both small and large groups, as well as individually on my own. The instruction is well thought out and is presented in a genuine, caring way with incredible sensibility that make you, as the artist, more willing to stretch yourself and experience something new. I definitely saw this happen when I took a large group of student leaders from Albion College to the studio during one of our training retreats. The experience was familiar for some, but most were experiencing this type of creative expression for the first time. It was a great way for the students to bond together while sharing in a group activity. I can't imagine taking my students any place else that would provide them with such a hands-on learning experience, while getting to know each other as a group. I would highly recommend Schuler Arts Studio to anyone looking for something different to do in a beautiful, open, relaxing and encouraging space with their class, youth group, church group, family and friends. My fiancé and I went for a date night, for the raku firing. We had such a great time! The atmosphere was so relaxed, and cozy. We ate a delicious lunch that was provided, we learned so much and were able to make a few different things together! So amazing! Another bonus was getting a tour of the gallery/studio and hearing the stories about the place and art pieces as well as hearing plans for future projects and construction! Would recommend to beginners or experienced people. I am happy to express my support and appreciation for Schuler Arts Studios and the creative arts services provided to Albion College departments and student organizations. The unique hands-on approach employed by Schuler Arts allows its participants to explore their individual creativeness alongside their colleagues and friends resulting in memorable shared group experience. Whether glazing pottery for the raku process, throwing your first vessel on the pottery wheel, or free forming a relief, the Schuler Arts studio provides helpful instruction in conjunction with genuine guidance, encouragement and support allowing you to be the artist. Most importally however, student and staff participants routinely comment on how honest-to-goodness fun the workshops really are. If you are looking for a shared group experience to help bring your team closer together or simply looking for an out-of-the-ordinary activity to increase social interaction, I highly recommend the workshops and classes offered by Schuler Arts. You might select from one of the pre-constructed programs, but if you looking for something a little more custom, please talk to the art studio staff to see if creating a unique experience for your group is possible. Schuler Arts is a valuable resource not only for students and staff of Albion College, but for the surrounding communities as well. Andy and Lisa French with children, Katelyn & Brennen and their special friends.